I couldn’t be happier that Friday is here! While this week was super busy for me, it still felt like it was never ever ending. Tonight we’re going to the Yankees game and trying to utilize the last bit of free time we have in New York to be with friends. I can’t believe that Casey, Harley, and I have only two more weeks up here! This summer has truly flown by and soon enough we will be back to our not so normal, normal schedules! I know I’ve mentioned my new found love for Abercrombie in several posts, but I really am super impressed with their style selections. I find that they have way more stuff online in comparison with what’s in the store, but you should definitely check it out if you haven’t done so recently. I think you’ll be pleasantly surprised!! This black floral maxi is just one of the many many items I’ve been wearing from their summer collection. Maxi dresses are perfect for day and night. I just love that they go with a variety of shoe options, from flats to heels and everything in between. wow cannot believe this dress is from abercrombie! seems like they’ve really reinvented themselves! What a great dress for transitioning into early fall with! Such a gorgeous print on you! I’ll have to make my way over to my Abercrombie this weekend! 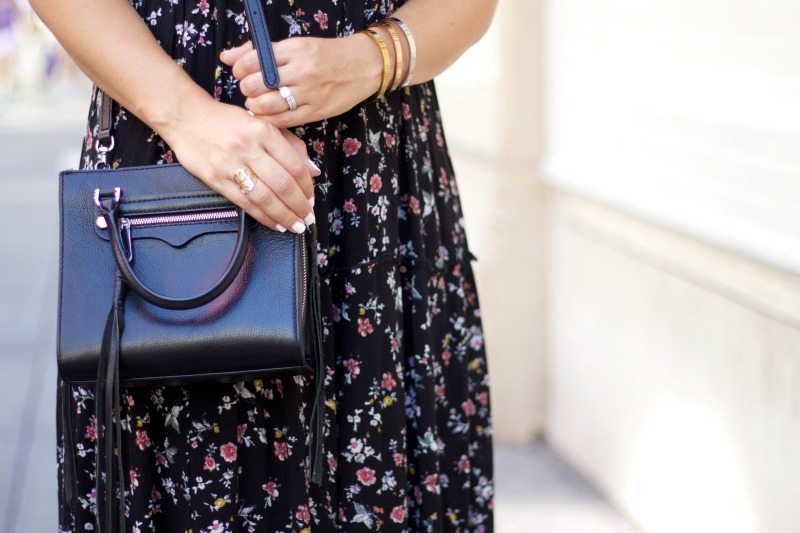 Such a cute maxi and LOVE that purse! Beautiful look! Abercrombie for the win! I need to add this dress to my closet. Looks gorgeous on you. This dress looks AMAZING on you!! I think I may need to get it for myself! That dress is so beautiful and your hair is gorgeous! Adore your photos girly! Such a cute dress – I need to check out Abercrombie again! I love your dress, perfect for fall too with a little cardigan. I haven’t shopped Abercrombie in the longest time but now I’m kind of curious, I will visit them shortly to see what they have going. What a gorgeous dress. I keep hearing how Abercrombie is back in the game! I need to stop back in, it’s been years since I’ve inhaled that overwhelming cologne as I’ve browsed the racks haha. Love this maxi dress! It’s been awhile since I’ve checked out abercrombie but I definitely need to look into their clothing! You look stunning! I love the recent clothing from Abercrombie! totally different from their 2008 vibes. I seriously want everything in this outfit, you are absolute perfection! What a gorgeous maxi dress! I love the dark color with the small floral print and beautiful cut! You look gorgeous AND can we just TALK about your hair? Serious #goals! Love this girlie! This is Abercrombie?! It is time for me to get back on over there. Also, I just love a good maxi, add florals and swoon!! Gorgeous maxi dress Jaime! Love the pretty floral print on you and cant’ believe it’s from AF!! Love maxi dresses, you look great!